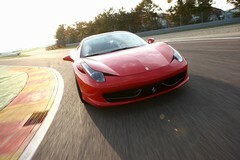 The mood seems unusually good at Ferrari at the moment. We're sitting in press conference and their specialists are taking plenty of time to detail the minutiae of their involvement with the 458 Italia. I'm not surprised: since I sat down I've hardly been able to keep my eyes off it. Driving is tomorrow, though, and tonight the talk is of air spring effect on the pistons, what the additional scavenge pumps for engine oil do, and the numbers describing the means by which the new multi-link rear suspension and steering combine to sharpen turn-in. I scribble the numbers and details into my notebook, and wonder if I'll be able to quantify the gains tomorrow. I can't - at least not in the numerical terms employed by Ferrari's engineers. 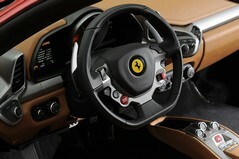 What I can say, though, is that the steering is about as sharp a set-up as I've ever experienced in a 'proper' road car. Turn the button-festooned wheel and the 458's nose responds with such clarity, such incisiveness that you really do have to re-calibrate where you'd usually turn in for a bend. Massive stopping power helps; the CCM discs wiping off the Italia's easily gained speed with ease, the pedal positive after an initial soft response. But it's a fleeting first experience. My quick squirt of the 458 Italia around the hills surrounding Maranello cut short by the need to get back to Fiorano for my allocated time on the track. Raffaelle Simone, Ferrari's young-gun test driver, is at Fiorano, tasked with demonstrating the 458's enormous breadth of ability around the circuit's challenging twists and turns. When you've been involved with the development of a car for years it must be galling to hand it over to a bunch of (sometimes) hapless journalists for their opinions, but Simone laughs it off. 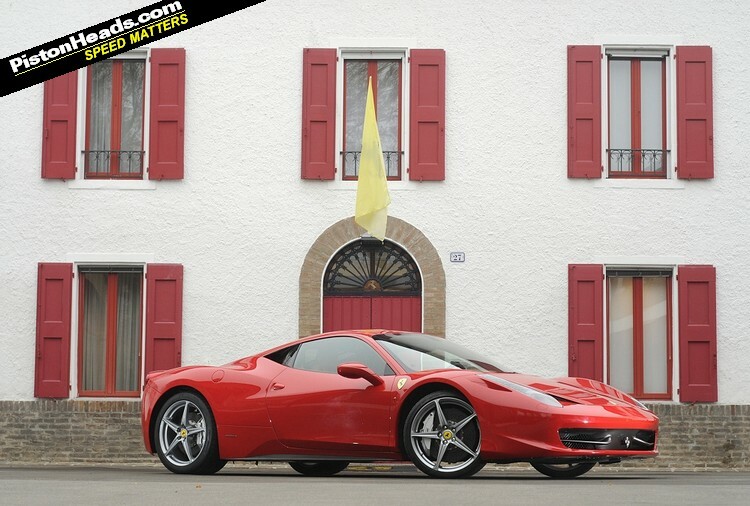 He's confident that he's done a good job with the Italia - with more than a little bit of input from all-round Ferrari god Schuey - and he's ably demonstrating it as I strain to stay in my seat while the 458 exerts its extraordinary forces upon me. 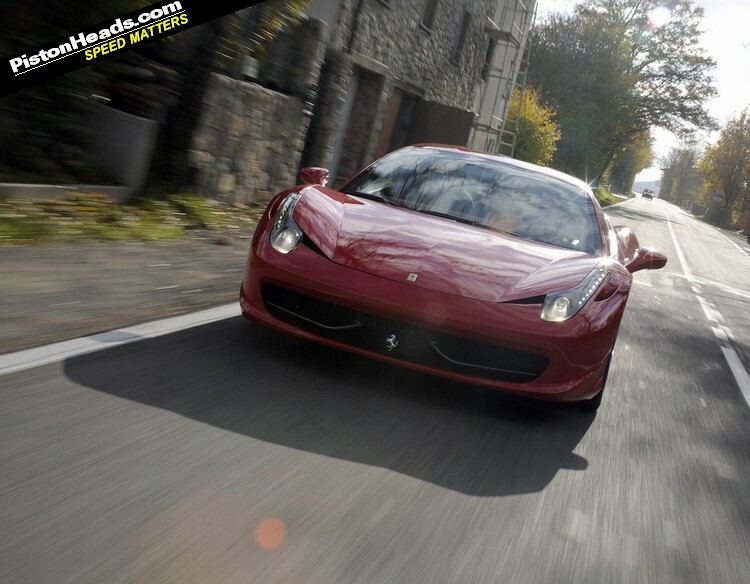 You all know it's pretty much all new, the 458 Italia, constructed from aluminium, powered by a glorious-sounding, exhaust flap-bypassing 562bhp, naturally aspirated 4.5-litre V8 that revs to a stratospheric 9,000rpm. You shift its gears via a 7-speed dual-clutch transmission, and it has all sorts of F1 sorcery working on the traction, stability, differential, engine and suspension. 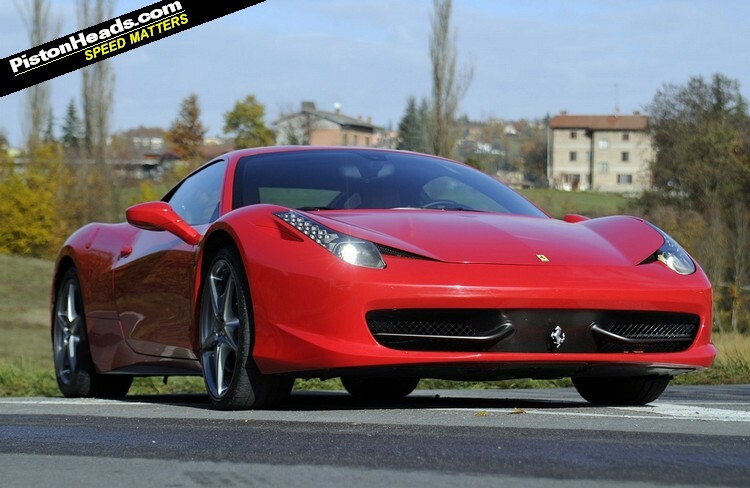 The 458 is able to reach 62mph in under 3.4 seconds and reach a top speed of over 202mph, and it's a looker too - at least I think it's the first Ferrari in a while to instantly captivate. 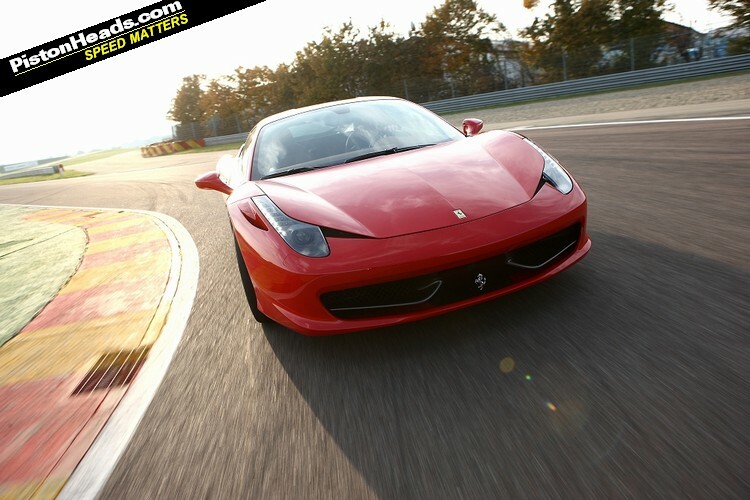 Whatever, I'd love just half his wheelman-ship, though when taking my turn on the track I quickly discover that, for all its ferocious performance, the 458 Italia is something of an easy car to drive. The steering is sublime, its engine a masterpiece that's amazingly tractable at low revs, and all the other controls combine to provide a quite brilliant driving experience. 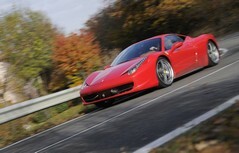 The suspension with its clever magnetic dampers offers quite ridiculous control and excellent roll resistance, though should the road get choppy there's the option - like the Scuderia - to maintain the harder, faster shifts and throttle response via the manettino in combination with a more compliant damper set-up. 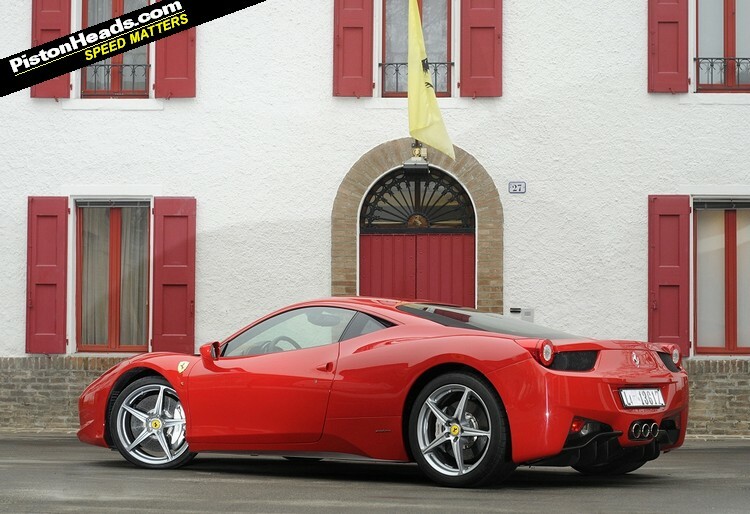 That manettino is something of a madness dial; turn it up to CST off and you're in full control, with the 458's numerous electronic systems disabled allowing the Italia to be driven above and beyond the tyres' limit of adhesion. 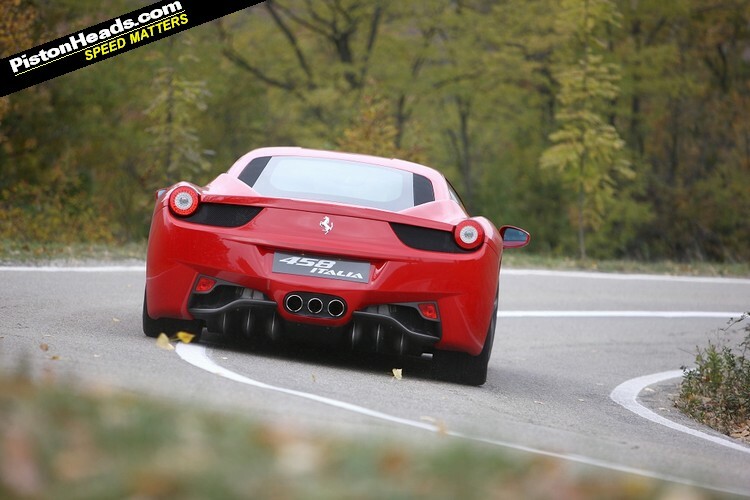 Never has 562bhp seemed so easily controlled, the instantaneous steering and accelerator allowing the 458 to demonstrate quite silly angles of slip exiting Fiorano's hairpin. It's so controlled, so easy you could do it all day long. 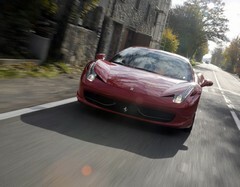 But the real-world beckons, so the 458 and I head up into the hills again to play. It's extraordinarily good, the Italia's route taking in the same roads I drove on the F430 Scuderia, 599 and 599 HGTE launches. 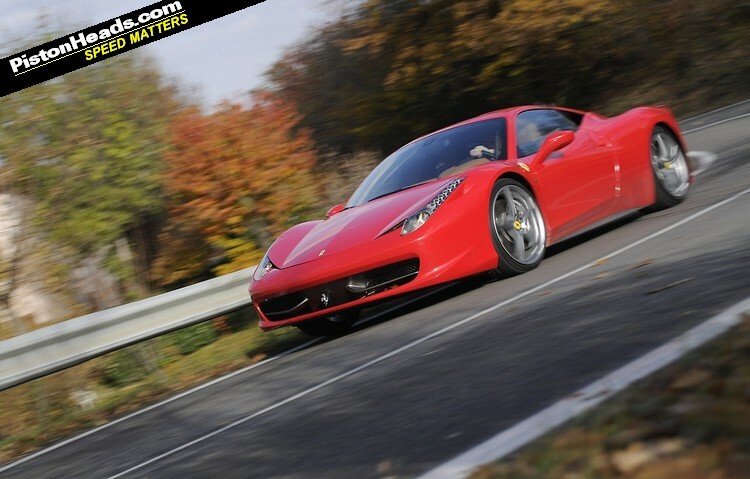 I'd be lying if I said I know them, but the 458 is so precise that I'm driving them like I do - such is the utter confidence the Italia gives you as a driver. If I've any complaints it's simply that turning the manettino from Race to Sport - as I'm doing regularly given the wet, leaf-strewn roads - means an additional press of the damper button to return it to its softer setting. You only really notice it in a bend, when the sharpness of the throttle combined with any bumps from the road transmitted through your foot can result in some jerkiness. The problem is removed with the more compliant suspension setting, and underlines just how quick the accelerator is to respond to your input. Quick enough in race mode to exit corners with a whiff of oversteer, the communication of the chassis and quick-witted steering allowing you to drive it with a showboating style. There's time when I get back to Fiorano for a coffee and a chat with Ferrari's people, each and every one of them wearing a confident smile that says the new McLaren MP4-12C is going to have to be very good indeed. They're not wrong. Great article... I can't wait until I get to see one of these. One question: what's the third exhaust pipe for? 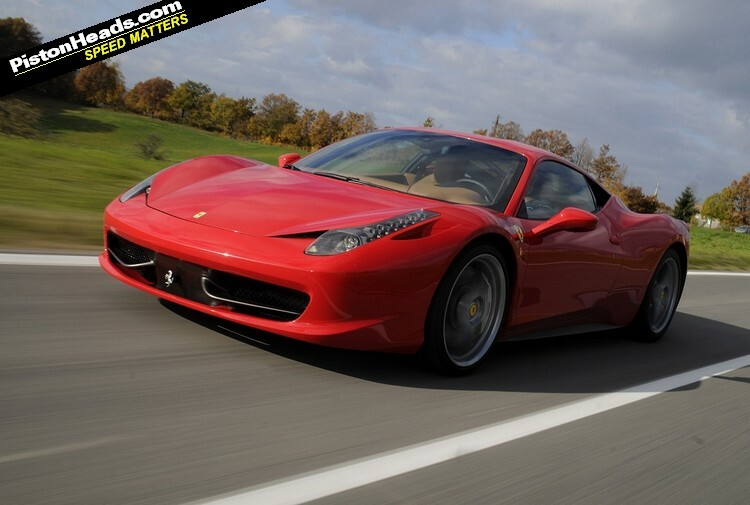 On the F40 it was a cooling air intake, but the 458 isn't a turbo...? It's just for show. I think they all exit the same silencer. I knew it would be good. Still trying to get over the huge price hike above the 430 though. Looks like I will be saving up a good while longer yet. Am I alone in thinking this is proper fugly?